Belle River Soccer House League is a community-based recreational program open to all players of any skill level and ability. Our House League program is strategically designed to offer fun and excitement to children in a team format, while supporting a healthy and active lifestyle for all players. It is divided into age appropriate divisions. EVERYONE CAN PLAY. Check out our Game Time and Rule Grid! We just want to take a moment and explain to you the rational behind the seemingly improbably u19 Division, (which includes u15,u16,u17,u18 players). Parents often are concerned that the age difference can be pretty significant and worry that a u19 boy is playing against a u15 girl and either will not pass the ball or be too rough. It is our experience that the u15 girl is just as aggressive as the u19 boy and the players do pass to each other. After all, this is a fun league. The only reason we do it this way is because we do not have the numbers to make the sub-divisions work. It has been very difficult to find enough players in any of these single age groups (u15, u16, u17, u18) to form their own teams. We have historically struggled to find enough players, in either gender to even create 2, let alone 4, 11v11 teams. They are high school kids. They have jobs and other distractions and enrollment in these age groups in any youth sport is rare. Therefore, to ensure we do offer soccer for our “High School Age Players” we combine these age groups together. They are all High School ages. 3) Subdividing the divisions to u16 and u18. And splitting the genders. We simply need the numbers to support it. For example; To create two u16 11v11 teams, we need at least 28 players born in 2004 and 2003. Believe it or not, we do not get that. What if there is not enough for 2 teams? They would play each other every week and in our experience, they won’t have much fun playing the same team each week, unless the teams are very evenly matched. But we would do it. We just don’t get the numbers. What if it’s not 11v11, What if you turned High School Divisions into small sided games? 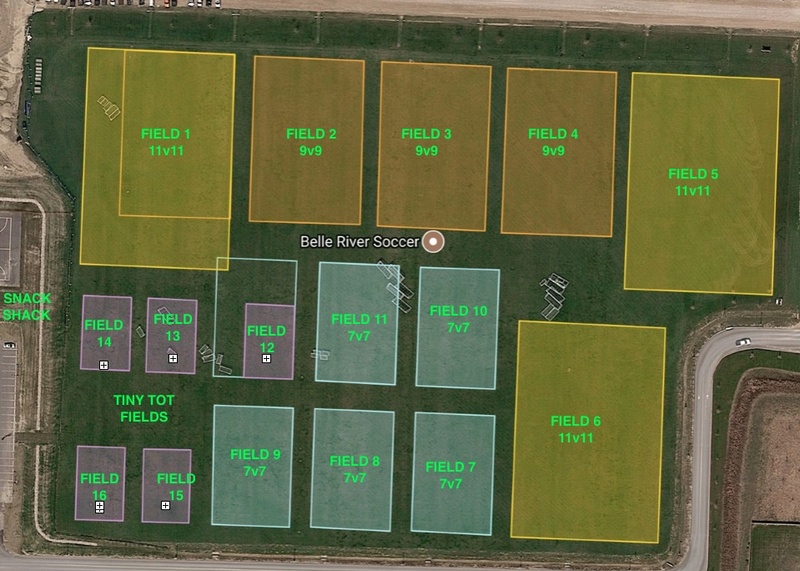 3v3 league (a team of 6 players) played on smaller fields. For a new small sided division to happen, we need to make sure the players want this. Many players want traditional 11v11 soccer. This summer, we will be asking players and parents for feedback and piloting an August program to see if it works. At any rate, we are open to any positive changes to our high school division as long as the numbers can support it. Belle River Soccer retains the right to make any change or alteration or modification to any roster, team or division at any time for any reason without notice. In addition we may remove a player, parent, coach or spectator from a practice, game or our fields at our discretion.